The Mesolift or Mesoglow or Meso botox is not an alternative to a surgical facelift but it can do amazing things to rejuvenate dry, tired and sun-damaged skin. Those factors that contribute to an "old, haggard" face deep with wrinkles are exactly was mesotherapy in the form of the MesoLift or Mesoglow is effective against. The Mesolift is a series of micro-injections that can revitalize the skin and tighten loose skin in the face and neck area. 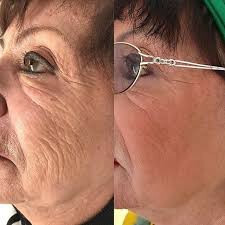 A natural looking and non-surgical facial rejuvenation. Hours to Recovery Not Weeks. 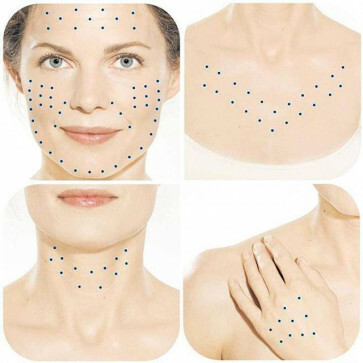 If the Wedding is on Saturday and today is Wednesday, there is no time to see a plastic surgeon for a consultation, but there is time for the facial mesotherapy. Side effects and complications are at an absolute minimal, results are seen within a day, some patients see them immediately! 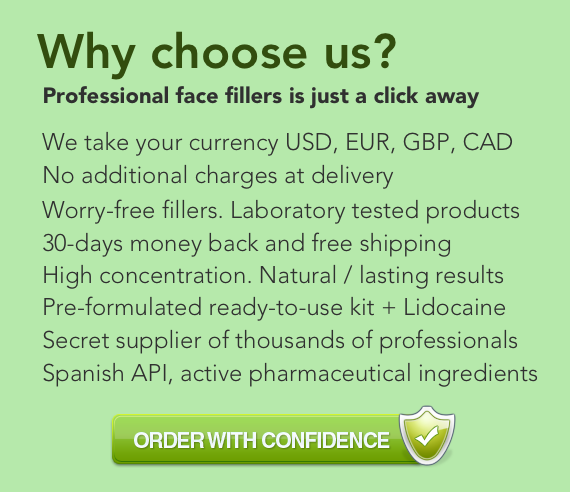 What Is In The Micro-Injections facial mesotherapy? Vitamins, minerals, amino acids, anti-oxidants which promote cellular hydration which in turn begins the rejuvenation process of rebuilding collagen. Facial mesotherapy is NOT collagen injections, but the necessary ingredients our body's need to produce our own collagen which is a spontaneous process! Different Mesotherapists use different solutions based on the needs of their patients. Ask your mesotherapy physician what they typically use for facial mesotherapy and in particular what is being used in your case. How many treatments, how often? Typically most mesotherapy providers begin the facial mesotherapy process with two treatments scheduled one to four weeks apart and then re-evaluate how many treatments are needed. Many mesotherapists like to give six treatments to maximize collagen production and hydration. The number of treatments needed are based on the individual case and the combined goals of the patient and physician. Maintanince treatments are usually schedule every 4-6 months. All medical procedures carry risks but In the hands of a trained, qualified health care professional it is very safe procedure. Included in the kit: 8cc Vial, syringes, needles. How long does it last? Dermal treatment without defined permanence. The neologism “MesoBotox” is used to express another way to practice the injection of “Botulinum toxin” according to a certain number of criteria which are characteristic of each individual. In a more philosophical way we can say that this is an “aesthetisation process” of the effects of the botulinum toxin on the human being. - There is a real complexity in anatomic relations of platysma muscles of the face, often with imbrications which render the precision of the utopian intra muscular injection. - If the anatomy of peaucier muscles of the face corresponds to a certain rigor of distribution for all individual, this is not the same for the importance of the muscular “volume” and of the muscular strength. The consequences on the morphotype of the face are very important. - Another aspect of importance is the underlying bony relief which can give a wrong impression of volume. - The big and infinite variety of faces since each face is unique. Each individual is defined according to its face and facial expressions which assert its personality. - We can notice there are faces with complex expressions and face with more simple expressions. - The respect of the patient desire by listening to her precise aesthetic preoccupations which don’t inevitably correspond to the vision of the doctor or the surgeon. - Movement: the total inability to move of a face because of the botulinum toxin is not really a gain of beauty and generally, to keep a certain movement inside the face is more interesting for the aesthetic of the face than the non movement. We can certainly say that movement is part of beauty and symbolizes life in general. On the other hand, the inability to move is rather a sign of death since the face is generally completely smooth. The face has lost all its expressions (pain, suffering, sadness, etc…) which are the personal reflection of the individual. - General aspect of the face: for example the bony reliefs which often serve as tensor to muscles (as the stake of a tent) or the more depressive areas as the rings where we must never inject botulinum toxin. We thus need to take into account the bony morphology of the face to realize a MesoBotox. - One of the effects of ageing on human being is a progressive narrowing of its openings on the exterior world: on the face, it is easy to notice the closing of the ocular opening and of the mouth. The maximal interest of the Botox and especially of the MesoBotox is to be able to relax the right muscles (orbicular) and thus to cause the reopening of the openings. This action is expressed by a new lighting of the face as if it better caught light. - Aesthetisation of the world: beauty and the glance of people. In this general frame the MesoBotox tries to perpetuate natural beauty. This technique goes the way which is asked by patients: “keep its natural”. It’s beauty but without the fact that we could distinguish the artifices of the toxin! It’s possible to realize a MesoBotox for every faces but also and especially for particular areas of the face, areas where the skin is thinner and the muscles flat. As any dividing in some cases, the indication of the MesoBotox is maximal. These cases are represented by faces with more complex expressions and whose overlapping of muscular functioning is obvious. These cases of face with complex expressions are even a standard contra-indication of the Botox, since this would lead to rather ill-fated consequences on this kind of face: feeling of “total covering with lead of the face”, of sinking and the general aspect becomes sad, dull, wrinkled and fixed. The MesoBotox must be a “botulinum toxin “à la carte”” determined by a detailed examination of the patient. To achieve a MesoBotox (or Natural Botox) is also to practice an aesthetic act of quality; the word “aesthetic” comes from Latin “aisthésie” which means feeling and perception at the same time. a) The movement of eye closing, forced. b) The movement of exaggerated eye opening with rising of the eyebrows: this one is very important to unveil a tendency of exaggerated rising of the eyebrow allowing to prevent the effect “méphisto”. c) The movement of frowning. d) The movement of an exaggerated forward kiss. e) The movement of an exaggerated upward smile. illustrations of the “cartography of the face on one hand and of the technique of injection on the other hand; thanks to the vasoconstriction, the papules are visualized. The technique of injection of the botulinum toxin corresponds to the criteria of the mesotherapic injection. Intradermic injections must be achieved in the medium derma in order to achieve a dermic papule so that a spreading can be done. 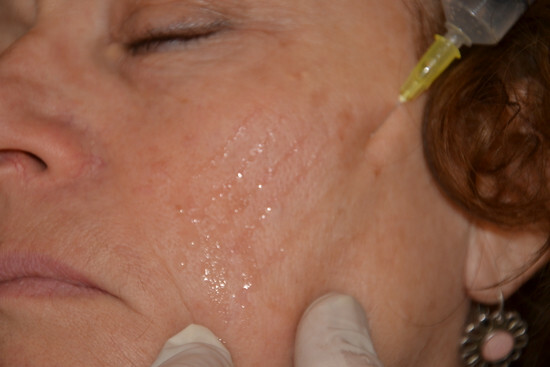 If a too much superficial injection is achieved, the papule becomes veside, the product remains at the level of the superficial derma and the underlying effect is quasi absent. 6) Case of use of D4. I used this dilution for the treatment of the dilated pores on some patients on which I had practiced Mesolifts with the botulinum toxin and which had pointed out to me a clear improving of their skin. After a detailed cleaning, with scaling of the black spots with a very thin comedo pulling out, I practice micro injections by catheterising the hole of the pore with an ultra small needle having a short bevel and I inject a bit of diluted toxin in order to make the skin whiten by the injection. This injection must not be painful since the needle is placed in the space of the pore and, moreover, the short bevel is very important to cause a resistance to the penetration. So there are no cutaneous injuries and it must not bleed! This nose just received around 4 unities of diluted Botox by intradermic. The obtained result on this type of skin is particularly efficient with a very clear effect on this very disagreeable aspect of “dilated pore”. This satisfaction indication is maximal. 7) Case of the “cosmetic” use of the botulinum toxin D5: by practising a Mesolift associating, for in ¾stance, 2% procaine and vitamin C, 1à unities of botulinum toxin are introduced in the syringe. The indication, a bit thick skins present dilated pores or a micro-acne. Of course the skin needs a previous cleaning or a microdermabrasion before the session of micro injections. AS Dr Lelouarn rightly specified in his article in the magazine “Aesthetic Plastic Surgery”, in order to avoid a too big diffusion of the product: in the short and thick muscles, it is better to use high concentration toxin, and in the flat and thin muscles, it is better to use diluted toxin. 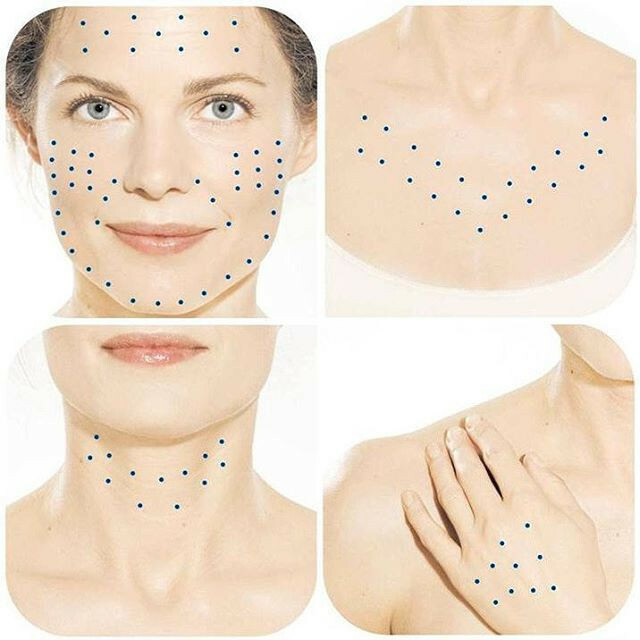 It’s already a bit of the idea of the MesoBotox; since the use of a diluted toxin on a short muscle leads to an inaccuracy of the injection hence an improbable result; on the other hand, on a flat muscle, we prefer that the product precisely acts in a more diffuse hence inaccurate way. In the MesoBotox, there is also the idea of a “temporisation of the effect of the toxin” which allows to obtain a smoother result, the “serene-like” effect that the patients ask for. Moreover, thanks to the dilution, the MesoBotox allows to inject the areas of the eye muscles where the use of a highly concentrated toxin always leads to complications. The MesoBotox can apply itself to all faces but not to all areas of the face. On the other hand, there are faces for which the indication of the MesoBotox is increased and obligatory. In conclusion, the idea of the MesoBotox in practice is really a “Botulinum Toxin à la carte”: “to each its Botulinum toxin”. 1- Carruthers A, Carruthers J. History of the cosmetic use of Botulinum A Exotoxin.Dermatologic Surgery 1998; 24,11. 2- Carruthers A, Carruthers J. the treatment of glabellar furrows with botulinum A exotoxin. J Dermatol.Surg.Oncol. 1990; 16:83. 3- Arnold W. Klein,MD Dilution and Storage of Botulinum Toxin Dermatologic Surgery 1998; 24:11. 6- Carruthers J,Carruthers A. The Adjunctive usage of Botulinum Toxine Dermatologic Surg. 1998; 24:11.